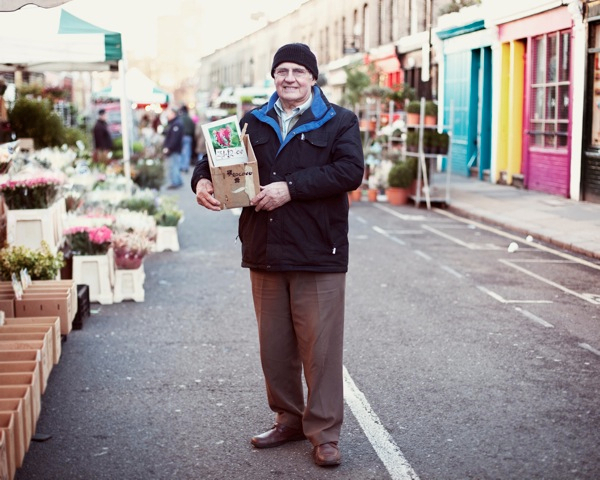 George Gladwell has been selling plants on Columbia Rd longer than anyone else and is the only one left who was there on the very first day of the flower market, just a few years after the war. Over eighty years old, yet still lifting heavy boxes and trading through every Winter, George possesses extraordinary vitality and as Chairman of the Association he is the spokesman for his fellow traders, which suits him well because he has greater experience of market life than anyone else and knows his own mind too. Softly spoken, although possessing a powerful physical presence, George has staying power and, remarkably, after more than sixty years of early mornings in the frost, he is still smiling. “I arrived in this lonely little street in the East End with only boarded-up shops in it at seven o’clock one Sunday morning in February 1949. And I went into Sadie’s Cafe where you could get a whopping great mug of cocoa, coffee or tea, and a thick slice of bread and dripping – real comfort food. Then I went out onto the street again at nine o’ clock, and a guy turned up with a horse and cart loaded with flowers, followed by a flatback lorry also loaded with plants. At the time, I had a 1933 ambulance and I drove that around to join them, and we were the only three traders until someone else turned up with a costermonger’s barrow of cut flowers. There were a couple more horse and carts that joined us and, around eleven thirty, a few guys came along with baskets on their arms with a couple of dozen bunches of carnations to sell, which was their day’s work. More traders began turning over up over the next few months until the market was full. There were no trolleys then, everything was on the floor. Years ago, it wasn’t what you call “instant gardening,” it was all old gardeners coming to buy plants to grow on to maturity. It was easy selling flowers then, though if you went out of season it was disappointing, but I never got discouraged – you just have to wait. Mother’s Day was the beginning of the season and Derby Day was the finish, and it still applies today. The serious trading is between those two dates and the rest of the year is just ticking over. In June, it went dead until it picked up in September, then it got quite busy until Bonfire Night. And from the first week of December, you had Christmas Trees, holly and mistletoe, and the pot plant trade. I had a nursery and I lived in Billericay, and I was already working in Romford, Chelmsford, Epping, Rochester, Maidstone and Watford Markets. 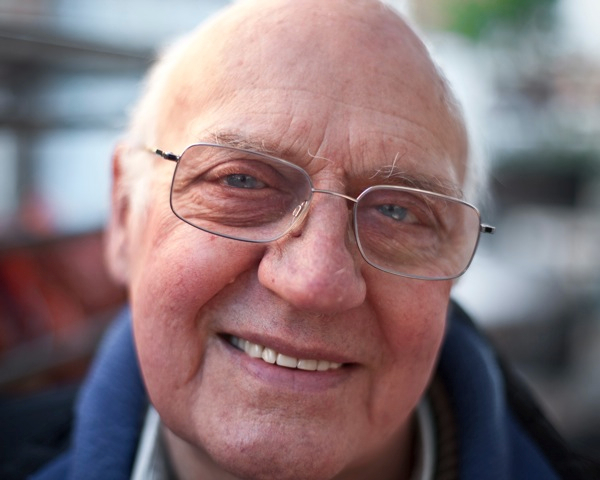 A friend of mine – John – he didn’t have driving licence, so he asked me to drive him up on a Sunday, and each week I came up to Columbia Rd with him and I brought some of my own plants along too, because there was a space next to his pitch. My first licenced pitch was across from the Royal Oak. I moved there in 1958, because John died and I inherited his pitches, but I let the other four go. In 1959, the shops began to unboard and people took them on here and there. That was around the time public interest picked up because formerly it was a secret little market. It became known through visitors to Petticoat Lane, they’d walk around and hear about it. It was never known as “Columbia Rd Flower Market” until I advertised it by that name. It picked up even more in the nineteen sixties when the council introduced the rule that we had to come every four weeks or lose our licences, because then we had to trade continuously. In those days, we were all professional growers who relied upon the seasons at Columbia Rd. Although we used to buy from the Dutch, you had to have a licence and you were only allowed a certain amount, so that was marginal. It used to come by train – pot plants, shrubs and herbaceous plants. During the war, agriculture became food production, and fruit trees planted before the war had matured nicely. They sold masses of these at the Maidstone plant auctions and I could pick them up for next to nothing and sell them at Columbia Rd for two thousand per cent profit. Those were happy times! In the depression at the end of the nineteen fifties, a lot of nurserymen sold their plots for building land because they couldn’t make it pay and it made the supply of plants quite scarce. So those of us who could grow our own did quite well but, although I did a mail order trade from my nursery, it wasn’t sufficient to make ends meet. Hobby traders joined the market then and they interfered with our trade because we were growers and kept our stock from week to week, but they would sell off all their stock cheap each week to get their money back. I took a job driving heavy haulage and got back for Saturday and Sunday. I had to do it because I had quite a big family, four children. In the seventies, I was the first to use the metal trolleys that everyone uses now. My associates said I would never make it pay because I hocked myself up to do it. At the same time, plants were getting plastic containers, whereas before we used to sell bare roots which made for dirty pitches, so that was progress. All the time we were getting developments in different kinds of plants coming from abroad. You could trade in these and forget growing your own plants, but I never did. Then in the nineties we had problems with rowdy traders and customers coming at four in the morning, which upset the residents and we were threatened with closure by the council. We had a committee and I was voted Chairman of the Association. We negotiated with the neighbours and agreed trading hours and parking for the market, so all were happy in the end. I was beguiled by the lyrical tone that George adopted to tell his story, while equally impressed by his determination and ingenuity to survive as a plantsman, sticking with what he loves most, cultivating plants at home on his nursery and selling them each week at the market. And, learning of the evolution of Columbia Rd, I could see that – in spite of the current uncertainty – the market has always been in a state of change. George told me that in the Spring after the harsh Winter of 1963, he was the only trader at Columbia Rd with Geraniums, which had been decimated throughout the East End by the snow. 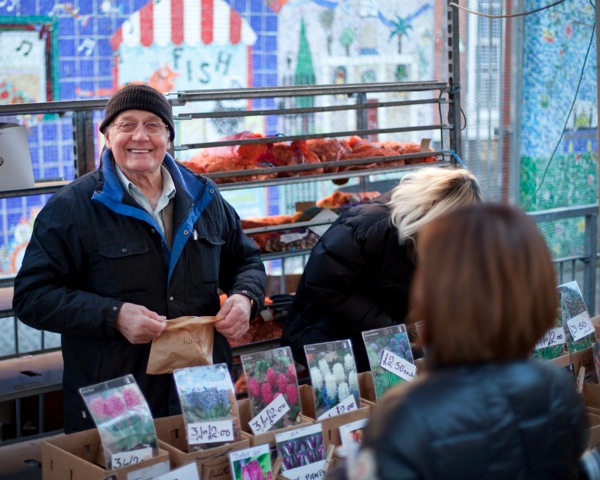 It was “a bumper year” he recalled, his eyes gleaming in fond reminiscence, and so, after this Winter’s cold snap, George Gladwell is anticipating a bumper Spring for plant sales at Columbia Rd Market. George will be keeping me up to date with the forthcoming changes to the market, but in the meantime he has a collection of photographs taken over the years in Columbia Rd and I hope to show you some next week. So lovely to hear of George anticipating his spring flowers – may they bring joy and colour and style to many homes.